When Team Elise was formed over 4 years ago, it was done so only a few weeks after Elise was diagnosed. Some shirts were hastily put together the night before and a handful of friends came out to walk. This year, Team Elise had over 100 people join us (we had close to 150 sign up, but many people had to back out due to illness and bad weather). Despite the rain, I was overjoyed at how many people came out and walked in support of Elise and people with diabetes everywhere. 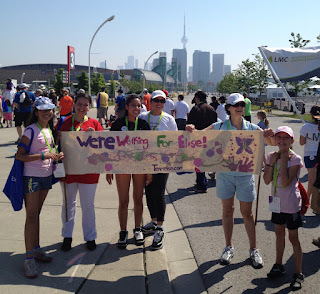 Last year, we had the honour of walking with almost 200 people, most of which had no connection to diabetes or Elise. It was one of the most beautiful things I have ever been a part of. Of course, there is also Team Elise Canada. Put together by Fred's Mom and sister in Toronto. 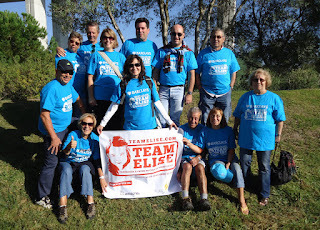 I love that we have people walking for Elise in my home and native land. This year, sadly, our friend Tiago moved away from Portugal. But I was blown away to learn that his Mom taken up the torch this year for Team Elise and on the very day we were walking in Texas, there was a group of beautiful people doing the same in Portugal. Not only that, but half a world away, Tiago was at it again... this time from his new home in Mozambique. Again, on the very same day we walked. Keep in mind, there is really no JDRF presence in Portugal or Mozambique, this was all done by people on their own time. I still cannot wrap my head around the love these people have shown us. And I don't think I can properly express just how much it means to me when people take the time to stand with us. On the days where diabetes has kicked me down, and I feel like I can't take one more minute of it, I think I will return to this post to bring me to my feet again. Thank you to everybody who has given me the strength to keep fighting this fight for my daughter. This give me goosebumps! Have you let JDRF know about this? so amazing to be surrounded with love and support from all over the world!! Glory and Alleluia, this is so wonderful. ahh this is beautiful......brings tears to my eyes!! !